This week was spent working with crochet pretty much all week. After looking at the layout of my list and how each category is grouped into 12 it seemed practical to aim for one project from each category to be completed each month. With this in mind it was time to turn my attention to clocking off some finishes in these categories. First finish of the week came with the second cloth in the Vintage Strawberry Ruffles Set. Again the same Tunisian Simple Stitch was used for this pattern and the project page for it is here. I set about finishing off the Flanders Poppies Blanket and my aim last week of getting as far as the border by this weekend was not only met but also accomplished. Here is a rough picture of it yesterday afternoon. I aim to take some proper photographs later today with a blog post tomorrow. The project page for it can be seen here. I just love how it turned out. I had a delivery of yarn on Friday for upcoming projects. the yarn top to bottom on the right is for another blanket, the lavender inspired blanket on my list. The yarn along the top left is for the next design of mine, I just need to finish off the one I’m on and send it to the testers and then I can swatch for it and on the bottom left are the two balls of fondant pink needed to finish the Rose Gingham Blanket. Having finished one blanket yesterday I did aim to try and get the border finished on the Rose Gingham Blanket and I was so close to accomplishing this, I’ve one and a half sides left to finish which hopefully this morning I can get a chunk of it done. Here is a photo of it completed without it’s border but I hope to be doing a FO post later in the week for this one also. So taking a look at my list and with the aims I have for finishing one project out of each category this month, it means this weeks projects I’ll be working on are The Water Path Cowl which I’d ideally like off the needles by next weekend with only blocking needing doing, Caoimhe’s Sunday Sweater which I am close to finishing the body off on but still leaves both sleeves, it might be a bit ambitious to hope it’s off the needles also and ready to be blocked but we all know I like a bit of ambition 🙂 I also have one last cloth in the Vintage Strawberry Ruffles Set which I should be able to squeeze in there also and lastly the finishing off of the Rose Gingham Blanket. My Ravelry projects page for YOP 4 is here with a full overview of wip’s and projects started. To check out other blogs taking part in YOP 4 or to join in head over to the Ravelry group here. 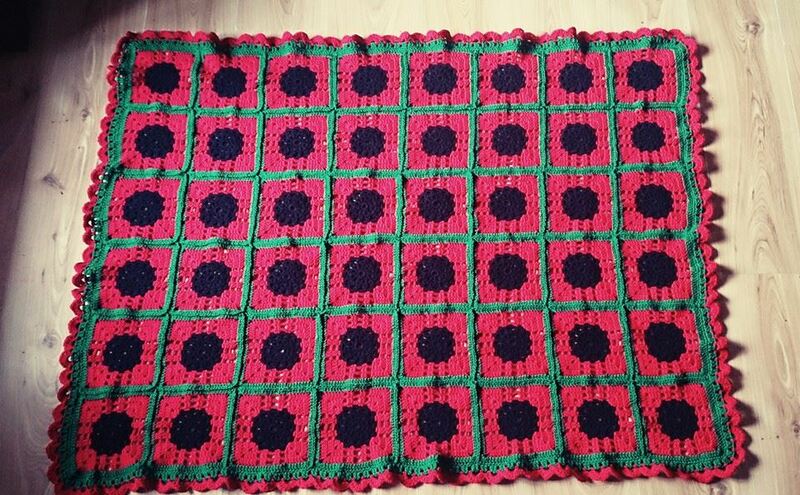 This entry was posted in Crochet, Finished object, Year of projects and tagged Flanders Poppies Blanket, Rose Gingham Blanket, Vintage Strawberry Ruffle Set. Bookmark the permalink. Thank you, it’s always great to see progress. Tremendous progress here! The blanket is wonderful. I love it’s bold colors and that edging is unique and just right for it. The second blanket is coming along fast. Look at all that great yarn. I want to touch and squish. That edging on the sole cloth has lovely texture like coral reef. Beautiful projects! Isn’t it fun to get yarn through the mail? I love the anticipation! The poppies blanket is fantastic but I think I love the gingham even more. Your tunisian crochet is looking very good. Great progress this week again. And the new yarn made my mouth water and finger itch. 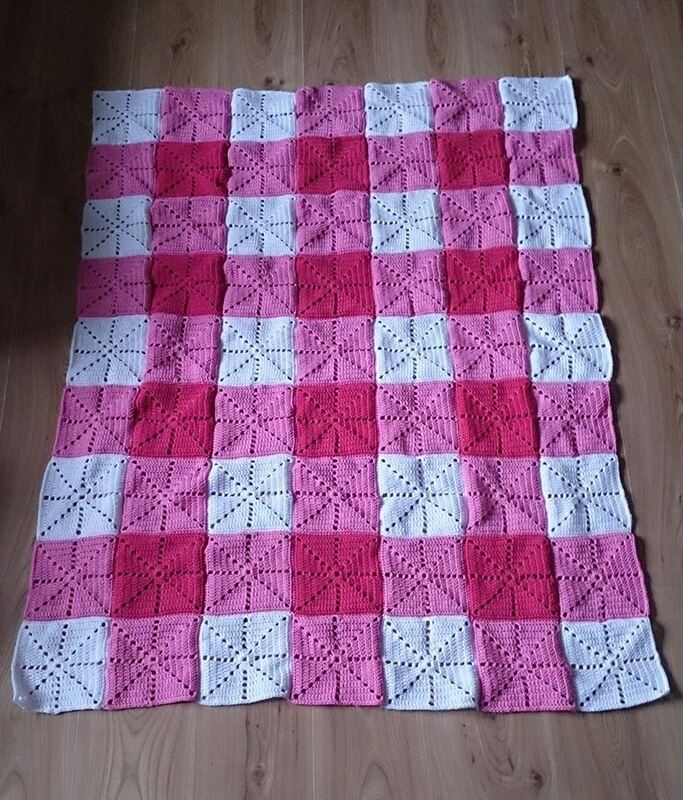 Wow – I love the gingham blanket, can’t wait to see it finished. Flanders poppies is fabulous and I do like your Tunisian stitch cloths. Ah but I sure would love to knit socks as quick and as often as you, it’s something I’ve not yet mastered. You rock! Those blankets at amazing… And I must learn to Tunisian as amazingly as you! Good plan…I’m loving both of your blankets…. I wrote a big reply and it wouldn’t post so I’ll try again but it will be short. 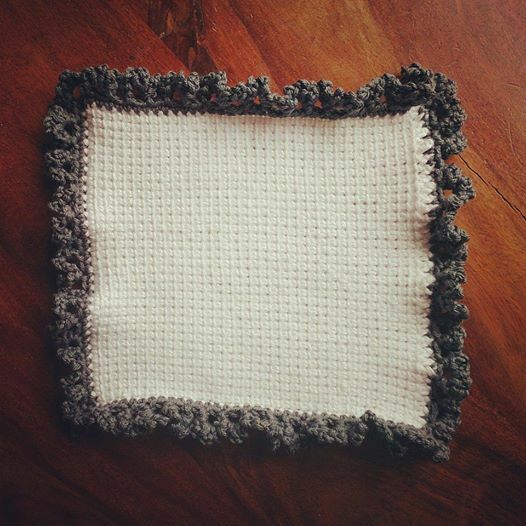 Loving all your projects and especially the blankets which are gorgeous. P.S. I came over to your blog..as I was having problems going through Ravelry…..as for the the Blackberry Salad..November would be great as I haven’t chosen colors yet nor ordered yarn for that project and this time I want to use inspiration as my color guide. I’ll be ready by then to startit. Thanks! Such a successful week! Everything is coming along very nicely! 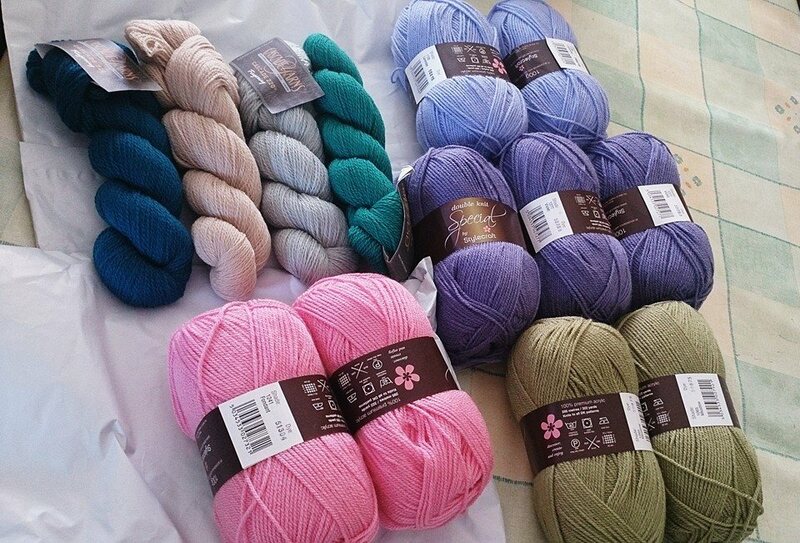 I love the Flanders Poppies blanket and what a lovely haul of new yarn. Thanks for welcoming me to the YOP group. The Rose Gingham Blanket is just lovely. You’re making great progress!